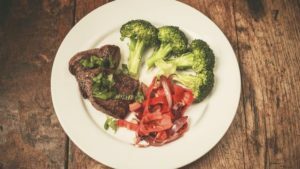 Meat and veggies no starch make a typical Paleo meal. Breakfast. a) Broiled salmon and cantaloupe. b) eggs, free-range organic eggs sauteed in olive oil, and add chicken or turkey breast, onions, peppers, mushrooms or other vegetables to make an omelet. Lunch. Broiled lean pork loin and salad (romaine, carrot, cucumber, tomatoes, walnuts and lemon juice dressing). Or salads with large portions of raw vegetables. Try mixed greens, kale or spinach with cucumbers, carrots or radishes, and add meat or seafood along with nuts for more protein and fat. Toss with olive oil and lemon juice or vinegar. Snacks. An orange, carrot sticks or celery sticks, nuts and berries. Drinking water and being physically active every day are very important to help your body burn fat and keep muscle. There are many studies to show the health benefits of following the paleo diet. A 2009 study involving 13 participants showed that following the diet resulted in lower blood sugar, blood pressure and triglyceride levels with an increase in good HDL cholesterol levels.